The information presented on this page was originally released on March 3, 2003. It may not be outdated, but please search our site for more current information. If you plan to quote or reference this information in a publication, please check with the Extension specialist or author before proceeding. Since gardening season is almost here, I feel compelled to remind you of a wonderful and honored plant that you might not have tried: the perennial phlox known as David. The summer phlox is one of the South's best-loved plants, especially the old-fashioned magenta-colored selection, and David may be its perfect partner. David is an erect perennial standing 36 to 40 inches tall. The glossy leaves are thin with bristly hairs on the margins. 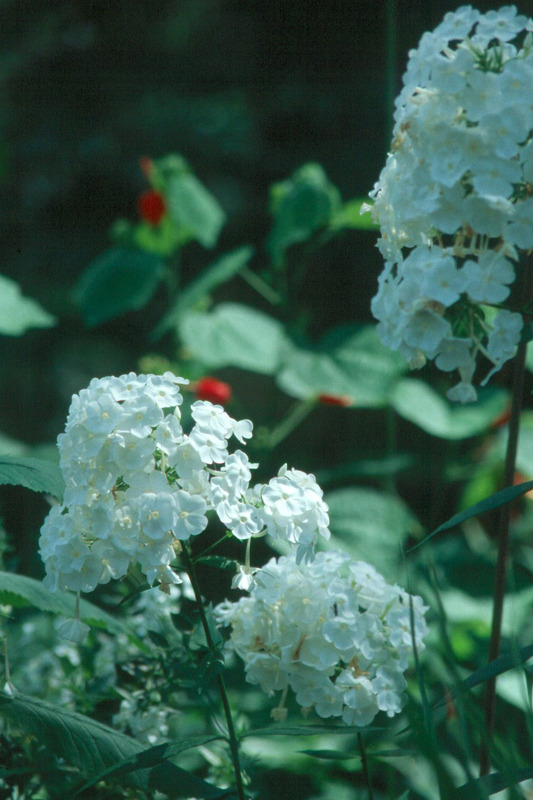 The pristine white, fragrant flower panicles are 6 to 9 inches long and 6 to 8 inches wide. David has a long bloom period during the summer and performs well in hardiness zones 4 to 9. One of its most outstanding attributes is its resistance to powdery mildew. David is an offspring of the native Phlox paniculata plants rescued and preserved in the 1980s by volunteers at the Brandywine Conservancy near Philadelphia, Pa.
David can be propagated easily by taking root cuttings, stem cuttings or divisions. Clump division simply requires the separation of crowns within a clump. Division is done in spring or early fall. Three to five crowns per division are sufficient for a one-gallon container. Root cuttings are best done after dormancy in the fall. David is an outstanding cultivar and was selected as the perennial plant of the year in 2002. In the South, it performs best in moist, well-drained beds located with morning sun and afternoon shade. Be sure and add a good layer of mulch after planting. Remove old blossoms from the plant to maintain vigor, prolong bloom and prevent self-seeding. Deadheaded plants will flourish into early fall. Divide plants every two to three years to maintain vigor. Although David is fairly resistant to powdery mildew, proper culture will further aid in mildew prevention. Thin plants to four to six stems to increase air circulation and to prevent a heavy mass of stems. Water phlox at the base of the plant and not on the foliage. Phlox paniculata is known as garden phlox, summer phlox or perennial phlox. It is a delight to all gardeners because it has a long bloom season. Many landscape designers consider it "the backbone of the summer border." David can be used in both the formal garden and the informal garden as in a cottage garden style or in a naturalized design. It provides great garden color and fragrance from June until frost if deadheaded. Use David with Magnus purple coneflower or Vista Red salvia. The blue violet flowers of Indigo Spires salvia highlight the white panicles of Phlox David for a striking combination. For a stunning effect, plant David with Miscanthus sinensis Morning Light or Miscanthus sinensis Cabaret to provide a color echo of the variegation of the grass foliage with the white flowers of David. If you are looking for a plant that will return year after year, is environmentally friendly from the standpoint of insects and diseases, offers fragrance, color and long season bloom, there is no better choice than perennial phlox David. It will be in much better supply this spring.